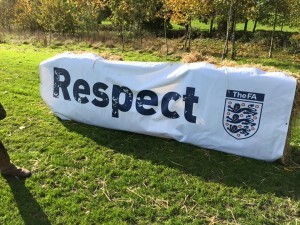 Worplesdon Rangers Football Club » ‘Thugs and Idiots’ Update: a Youth Football League Fights Back…. ‘Thugs and Idiots’ Update: a Youth Football League Fights Back…. Well what a week that was! I really owe everyone a huge thank you for the 100% support for my position I emailed out earlier in the week. As usual my view was one from wearing my heart on my sleeve and it resonated with so many of you, not just in the league, but country wide, leagues and individuals. With an inbox that exploded its been a little difficult to come back to you all. Being on the end of Viral was a new experience. However every email was read, we have huge momentum that I will now not let go of. As an update I will be meeting With Surrey County FA this coming week in, Caroline McRoyall (CEO), Tom Holder (Football Services Manager), our own Frank, to propose some firmish plans that Frank and I have. Both Frank and I are on the same page that we can do something significant to turn this around, and make the match day much more pleasant for the children, the referees and the spectators. This will in the end be owned by all of us, League Led with more ownership at club level, we want to give you more teeth. Once this is formulated then I will be calling together a number of clubs to test the idea in a workshop or two, and then we will seek to get this adopted at the AGM ready for roll out next season. To help us move this through I will help to galvanise this with the media who have supported us, we reached the media at national level as a couple of the parents of children in the league hold significant positions in the media. They I know will help us provide a balanced view, and publicise the progress of a new initiative to tackle this problem at source, the power will be with the children – watch this space. I promise you I will not let up now, so from a point of despair, I am now energised to move forward and do my best to stamp out the undercurrent of abuse and bad behaviour that leads to the events I highlighted – Frank is still clearing the mess up. Please go and enjoy tomorrow, cascade this information out, and give everyone some hope that we will fix this. Please start tomorrow by making this bad behaviour socially unacceptable, just challenge people to behave, please be brave, we have the weight of everyone in the country behind us. I will update you all soon. Easter Special at Woking FC – U16s Go Free!